Ben and I had the pleasure of welcoming our dear friend Rebecca to Durham for a night before she heads back to Sweden! Rebecca has been serving in full-time ministry in Uppsala, Sweden for the past year, and was able to come back to the States for a few months this summer to raise support for the next year. It’s amazing to hear what God has been doing overseas through her and her teammate, Rachel (who is another good friend from college that we unfortunately didn’t get to see this summer). God has smiled on both of these amazing women and we are so blessed to have them both in our lives! To celebrate Rebecca’s stay with us, I decided to cook up one “last” Tex-Mex meal for her. Rebecca is from Texas. If that needs any more clarification, she loves anything and everything with beans, meat, and cheese. Tortillas are the icing on the cake. When I asked her what she wanted for dinner tonight, she said “Tex Mex! Or anything from your blog!” Apparently she hasn’t had enough Tex-Mex for being back in TX for the past month… I suppose some things never get old. Well, now she can make some good ol’ fashioned Texas home cooking from her apartment in Sweden- AND it’s something from my blog! Win. Spray bottom of crock pot with cooking spray. Layer onions, peppers, and chicken breasts. Dissolve half a taco seasoning packet in 1 cup water and pour over chicken. Sprinkle remaining seasoning over top of chicken. Cover and cook on low for 4-6 hours, until chicken is tender. Preheat oven to 400 degrees. Mix together creamed corn, milk, egg, 1/4 cup shredded cheese, pinto beans, cumin, red pepper, green chiles, and corn muffin mix until just blended. Batter will be lumpy. Spread evenly into the bottom of a greased 9×12 casserole dish. Bake at 400 deg for 15 minutes until just set. Remove from oven and pierce liberally with a fork. Pour enchilada sauce over top. 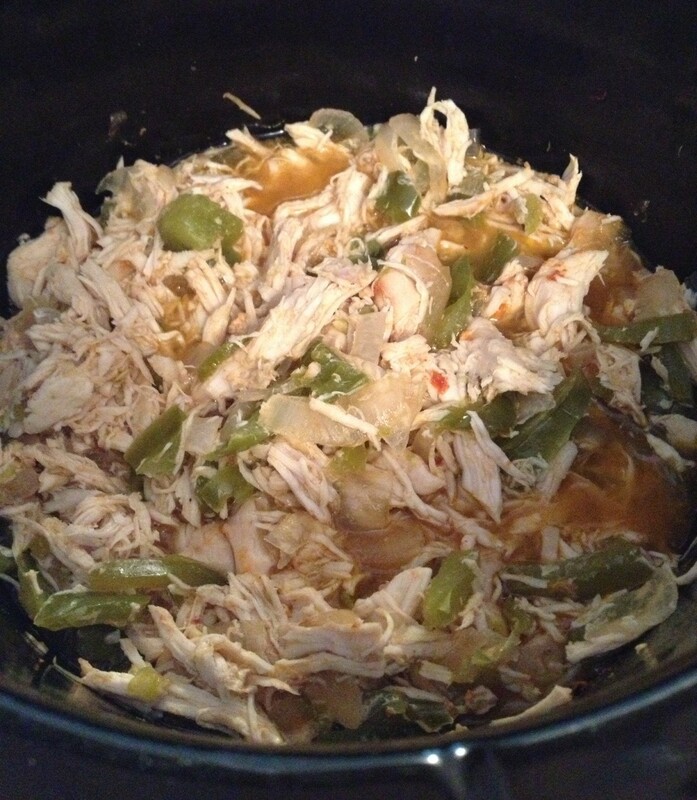 When chicken is done, shred and mix into peppers and onions. Pour over top of casserole and sprinkle remaining 3/4 cup cheese over top. Bake 15 additional minutes at 400 degrees. Remove from oven and allow to cool for 5 minutes. Serve with a dollop of sour cream and roasted corn (recipe below) or a green salad on the side (or both)! 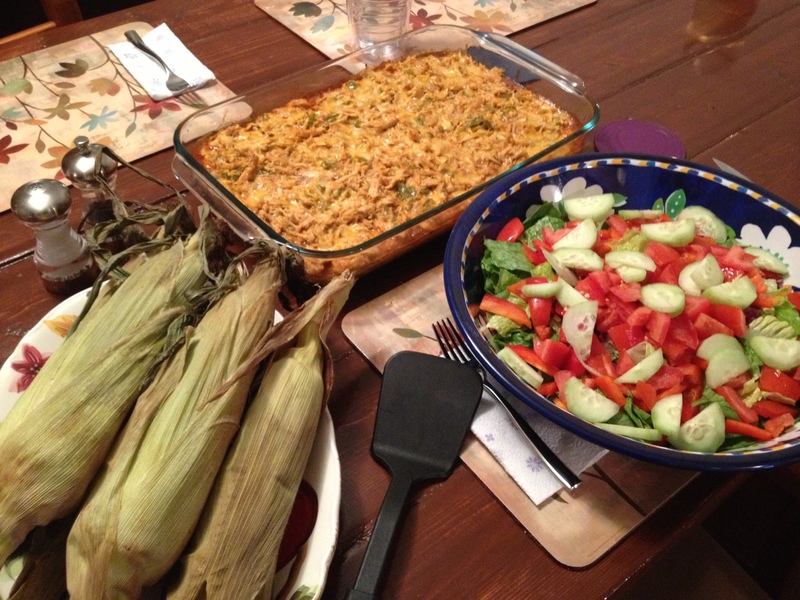 To make some succulent roasted corn in the oven, simply preheat oven to 400 degrees. Place corn, in husks and all, on the bottom rack of the oven. Bake for 30 minutes. To tell if corn is done, lightly squeeze sides of husks. Corn should be slightly tender. A great go-to comfort food casserole for those summer nights when you’re not sure what else to make! 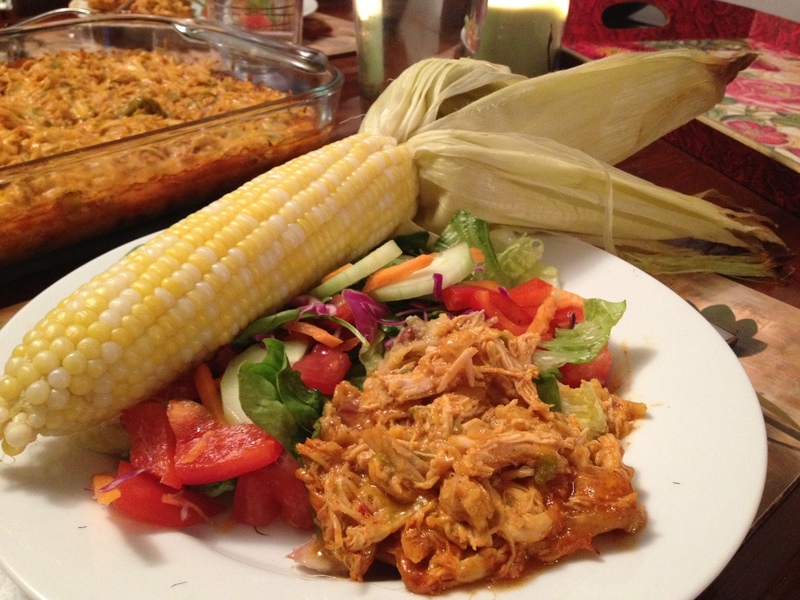 I love the cornbread on the bottom mixed with the creamed corn- it adds a little bit of sweetness underneath the heat of the enchilada sauce! Place onions and peppers in bottom of a well sprayed crock pot. Layer chicken on top. Mix 1/2 packet taco seasoning with 1 cup water. Stir until dissolved. Pour over chicken and vegetables. Sprinkle remaining taco seasoning on top of chicken. Cover and cook on low for 4-6 hours, until chicken and vegetables are tender. Shred chicken and mix into veggies. Turn crock pot to “warm” setting. Mix 1/4 cup cheese, milk, egg, cumin, red pepper flakes, cream corn, corn muffin mix, and pinto beans until just blended. Batter will be lumpy. Spread in a well-sprayed 9×12 casserole dish. Bake at 400 deg for 15 minutes, or until center of cornbread is set. Remove from oven and pierce liberally all over with a fork. 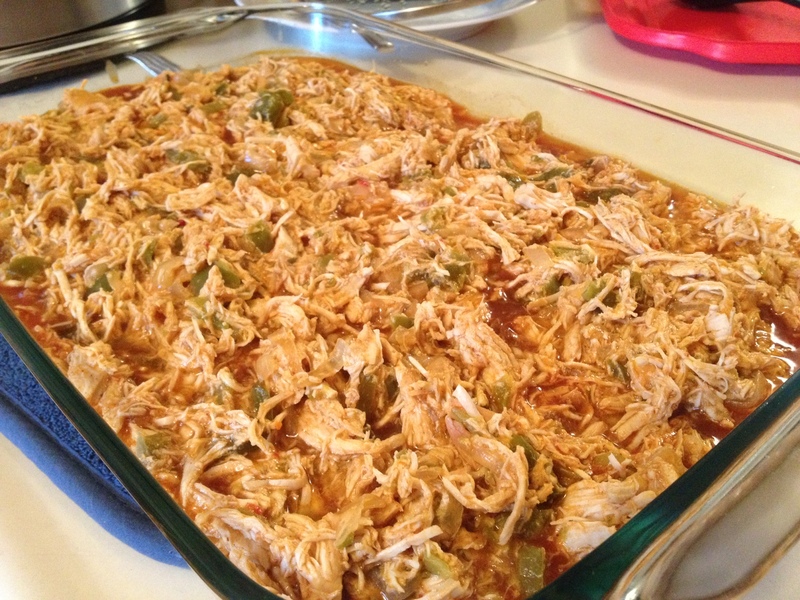 Pour enchilada sauce over casserole. Layer chicken, pepper, and onion mixture over top. Sprinkle remaining 3/4 cup cheese. Bake 15 additional minutes (or until cheese is melted) at 400 degrees. Allow to cool for 5 minutes and serve with a dollop of sour cream!